Imagine five slabs of fine wood. American cherry, ambrosia maple, mahogany, white oak, black walnut. Each plank between six and nine feet tall, eighteen to twenty inches wide. The boards finished by artist Sal Brownfield to a French wax brilliant surface and supported vertically in industrial steel frames. Then imagine Brownfield, with the supervision of law enforcement at a gun range, shooting multiple times through each of the five polished slabs. A different weapon used on each board. Imagine a 300+ square foot “grove” of five freestanding, highly polished wooden slabs – scarred front and back with bullet holes. The capacity of each gun to kill manifest in the size and splintering of the holes. At the base of the installation, river stones, dried leaves, and brass plaques identify the weapons used and the kinds of wood. Imagine walking through the “grove” reaching out to rub the polished surfaces. Fingers stopped by bullet holes. Fingers exploring the holes. Nearby a video loop of Sal Brownfield discussing with law officers the destructive power of the guns he will use. As Brownfield fires the weapons, a super slow motion camera records the impact and exit of bullets through each slab of wood. Inserted in the video between gunshots, brief sequences of everyday sights and sounds. Playgrounds, movie theaters, streets, city parks, class rooms. 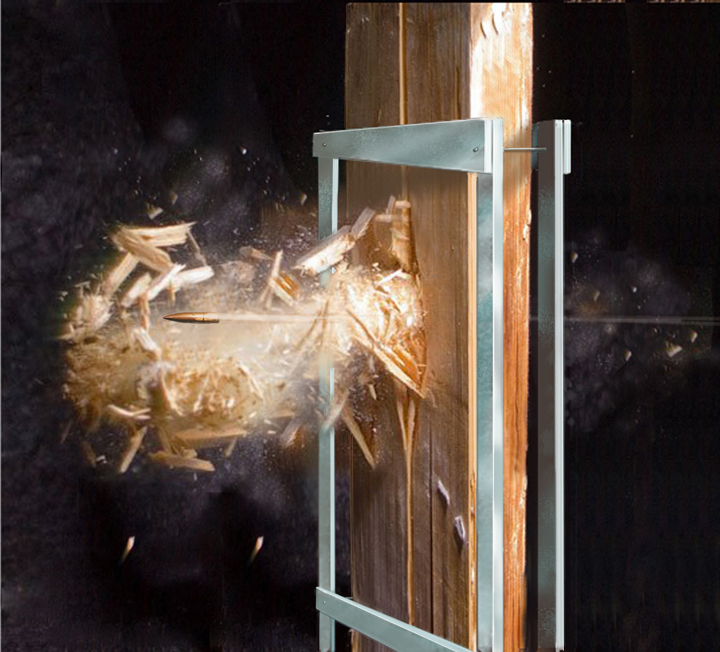 SHOT WOOD, an art installation, graphically brings home the capacity for violence and destruction of easily-available, commonly-used firearms.